The legislative basis and intent for pollution licensing in New South Wales is comprehensive and provides the Environment Protection Authority (EPA), as the regulatory authority for most pollution, with the ability to consider and protect a range of environmental values through the environment protection licensing system. Despite this ability, this is not occurring in New South Wales. The current regulation of pollution is far from achieving its aims to protect and enhance the quality of the environment, to maintain ecologically sustainable development and to prevent degradation of the environment. These aims are enshrined in the objects of the Protection of the Environment Operations Act 1997 (NSW) (POEO Act) and were widely proclaimed with the introduction of the Protection of the Environment Operations Bill in 1997. This article focuses on the current failures in the implementation of the pollution regulation framework, which have resulted in the degradation of many waterways as a direct result of industrial waste discharges, licensed under the POEO Act. It makes a number of key recommendations for reform of the pollution licensing system, including greater consideration of cumulative impacts of key pollutants, broader coverage of licences, expanded use of market-based approaches, independent monitoring and enforcement, continuous improvement and enhanced public participation. Although this article focuses on case studies involving water pollution, many points are applicable to the licensing and regulation of other types of pollution. The operation of s 100 of the Constitution, both as a justiciable limit on Commonwealth legislative power and more broadly, remains largely unexplored. This article examines the drafting history of s 100 to uncover the High Court’s anticipated role in relation to State/Commonwealth and State/State disputes generally, and concerning the use of interstate river water. Further, this article looks abroad to the experience of other constitutional federations (namely, the United States, Canada and Switzerland) in managing interstate rivers to better understand the role that notions of non-justiciability and judicial deference may have in limiting the role of the High Court. Finally, in light of this comparative study, this article evaluates the limits of the future judicial review and interstate dispute resolution roles of the High Court in relation to interstate river waters. For many countries around the world, including Australia, ensuring energy security is a recognised priority. In particular, security of oil is at the forefront of energy security policies due to its use in the transport sector. Many strategies are now being implemented to decrease reliance on oil from development of alternative fuels to use of electric vehicles. This article assesses the adequacy of Australia’s energy security policy in the road transport sector and comments on what lessons, if any, can be learnt from the United States and China. It concludes that a solution to this issue will not be one dimensional and will require the consideration of a number of differing perspectives. Recent changes in 2011 to the Victorian planning framework for windfarm developments raise significant questions about the capacity of planning law to balance local concerns regarding development impacts with the need to facilitate the uptake of wind energy to meet Australia’s Renewable Energy Target and to contribute to its climate mitigation effort. The pre-amendment planning law framework, despite being strategically geared toward promoting renewable energy at the policy level, had a number of shortcomings. The 2011 amendments fundamentally changed the nature of planning decisions around windfarm developments by greatly extending spatial development controls via windfarm “no go zones” and by shifting the focus of assessment to local impacts. 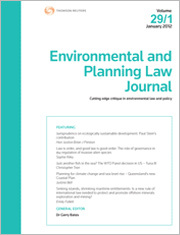 In light of this reorientation in Victorian planning law, this article considers the features of an effective windfarm planning framework that can effectively balance local and global interests. It draws in part on a comparative case study of German planning law, which has enabled Germany to successfully increase the proportion of wind energy in its energy profile. For the pdf version of the table of contents, click here: EPLJ Vol 29 Pt 5 Contents.